Apple's maps: they were a trap! Imagine that you're not very good at DIY. You go to hammer in a picture hook, but you hammer in too hard and knock a hole in the wall big enough for a man to climb through. It gets worse. You go into the hole, and discover that it's full of monsters - monsters that feast on human flesh. You fight and kill them, but end up hopelessly lost in a leafy forest. You spend the next three months existing on berries and insects, trying to find a way home, and finally one day you stumble upon a kind witch who sends you back to your house, mends the hole in your wall and hammers in the picture hook for you. You look at your mystified partner, and cackle. "Exactly as I planned!" Is that what Apple did with Maps? The short answer, of course, is no, because I'm rambling on about daft things. 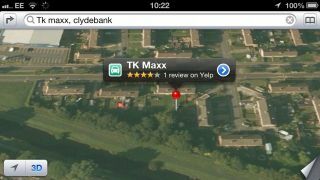 But according to a nice wee theory that's doing the rounds, the whole Apple Maps fiasco was entirely deliberate, a masterstroke rather than a mess. It's expressed best by The Loop reader Keith Huss, who suggests that "Apple took one for the team... and fooled Google into doing exactly what Apple has been asking for years. Users win." He's quite right that we win, because all the things Apple's Google-powered mapping didn't have - turn by turn directions, vector maps, voice guidance - are now in Google's iOS app. However, the idea that the whole thing was an elaborate trap simply doesn't make sense. Apple isn't laughing here: it's reeling from multiple blows, some of them self-inflicted. The maps fiasco has cost Apple dearly. It's wasted enormous sums on building a mapping platform that doesn't work properly yet, been forced into making a public apology and cheerleading for other firms' products, lost a key executive (Maps may not have been the sole reason for that, but it was still a factor) and become a laughing stock. But, hey! Google Maps is quite good! It's a nice theory, but my money's on dumb rather than diabolical: while things appear to be working out just fine for us, the global "yay!" that greeted Google Maps for iOS this week must have made Apple's bosses furious. We may have ended up in the right place, more or less, but Apple certainly didn't plan this route before setting off.